Actin cytoskeleton morphological changes induced by Rho/Rac/Cdc42 Activator I (Cat. # CN04) treatment of Swiss 3T3 cells. Cells were fixed, stained with Acti-stain™ 488 phalloidin (Cat. # PHDG1), and visualized by fluorescence microscopy. Kim et al. recently evaluated the potential anti-tumor effects of aripiprazole (ARP), an atypical anti-psychotic used to treat neuropsychiatric disorders. In the search for novel anti-cancer therapeutics, the authors examined if ARP affects the viability and migration of various cancer cell lines (e.g., U251 glioma cells, MDA-MB-231, HEK293) by a variety of in vitro and in vivo experiments. ARP inhibited cancer cell growth, survival, and motility by inducing apoptosis. Next, possible molecular targets of ARP were explored. Many anti-cancer compounds target the oncogenic tyrosine kinase Src as it is important for cancer cell survival, proliferation, migration, and invasion. ARP inhibited phosphorylation of Src, its auto-phosphorylation activity, and Src’s kinase activity. To decipher how ARP affects Src, ARP’s effects on actin polymerization were examined as re-arrangement of the actin cytoskeleton activates Src. 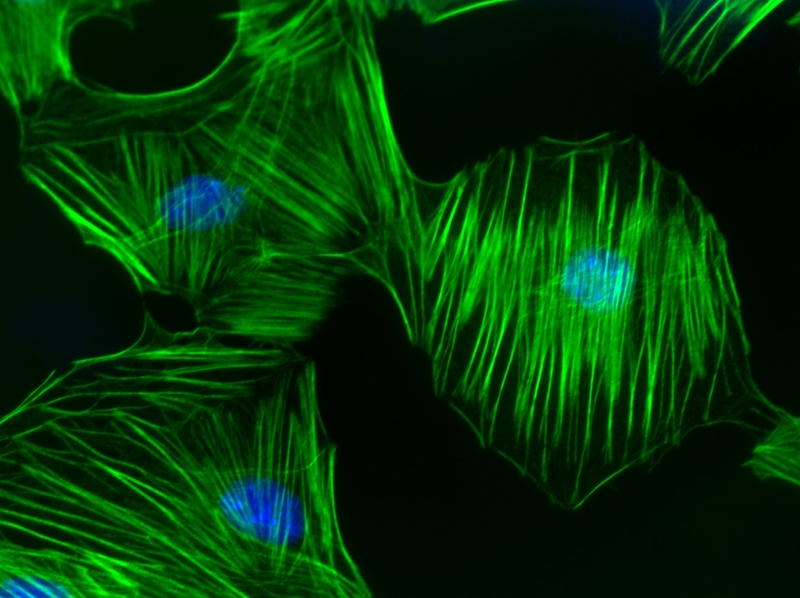 In conjunction with phalloidin staining images, the polymerization data demonstrated that the actin cytoskeletal dynamics were not molecular targets of ARP-mediated cancer cell apoptosis. Cytoskeleton’s actin polymerization assay kit (Cat.# BK003) was essential in demonstrating that ARP does not carry out its Src-mediated anti-tumor effects through an interaction with actin and regulation of actin dynamics, thus eliminating one molecular substrate in the search for ARP’s mechanism of anti-cancer actions. Kim M.S. et al. 2018. Src is the primary target of aripiprazole, an atypical antipsychotic drug, in its anti-tumor action. Oncotarget. 9, 5979-5992.